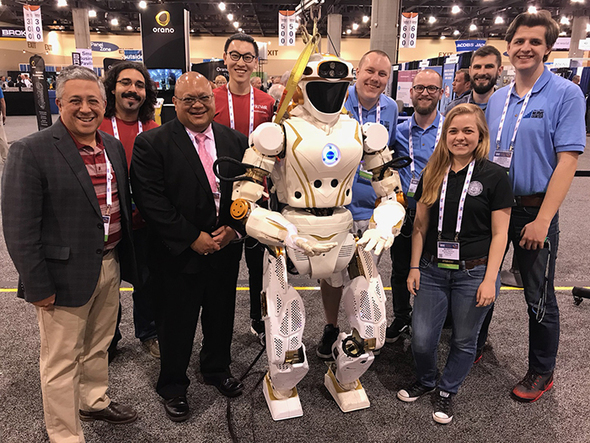 NASA’s humanoid robot, Valkyrie, gathers with participants in this year’s Waste Management Symposia, including Rod Rimando, director of EM’s Office of Technology Development, at left of Valkyrie. 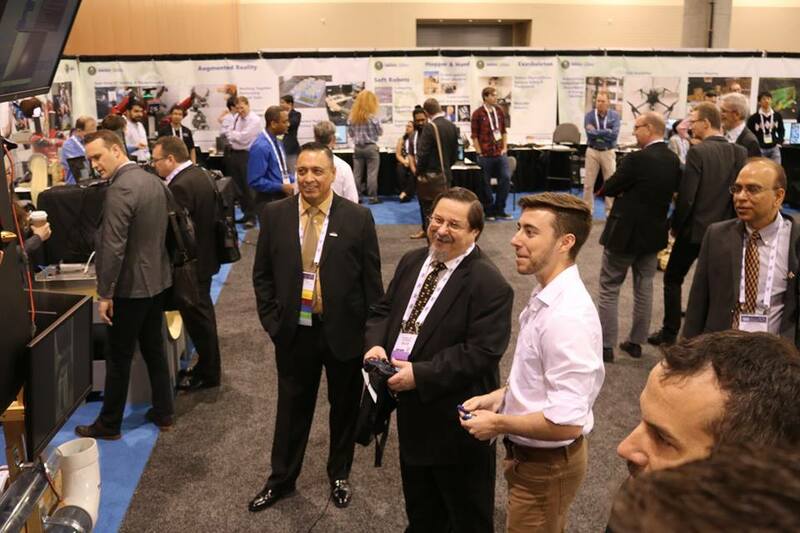 PHOENIX – A wide range of robotics developed by universities and used in EM’s cleanup were on display at this year’s Waste Management Symposia. One of three Florida International University robots deployed at EM sites, the Mini Rover is a miniature robotic system designed for inspection of double-shell tank floors at the Hanford Site. It can be deployed to slots from the annulus and provides visual feedback as it maneuvers through bends to reach the central plenum. The system can house a variety of sensors, including those for temperature and radiation. Activated by a smartphone, the Pipe Crawler can travel through the air supply line that leads to the central plenum of the tanks at Hanford. It provides information regarding the health of the tank floor around the tank’s center. The crawler’s movement mimics that of an inchworm and can navigate through several 90-degree elbows, reducers, and vertical runs. It also houses a camera for video feedback. The Wall Crawler is a low-cost system with a camera capable of traversing both flat and curved surfaces for monitoring and inspection. It can navigate upside down or on vertical surfaces. This robot assists in the inspection of the Savannah River National Laboratory H-Canyon tunnel. Unmanned aerial systems, or drones, have become an asset in hazardous facilities. They have many capabilities, including mapping, sampling, and source localization. Mapping includes collecting high-resolution images and data of environments through safe navigation and control. Sampling is safely accomplished by using drones with a human controller in which the drone finds a clear elevation, flies through cluttered space, and stops for a controlled sample. Active and decommissioned nuclear sites, and those scheduled for decommissioning, are critical facilities requiring inspections involving radiometric surveying. Drones enable remote access, radiation mapping, and radioactive source localization. University of Reno-Nevada, Carnegie Mellon University, and Purdue University featured these robots at the conference’s Robotics Pavilion. NASA, Northeastern University, and University of Massachusetts Lowell work together on the cooperative control of humanoid robots for remote operations in nuclear environments. The team demonstrated the Valkyrie robot’s capabilities at the conference. Working with glove boxes is common in operations at nuclear facilities. This task poses potential contamination hazards to workers. Use of robotics under human supervision could provide a safer alternative. The Johns Hopkins University Applied Physics Laboratory developed dexterous dual-arm robots. The laboratory’s team demonstrated a robot’s limb coordination system, which enables independent control of the robot arms and coupled motion required to hold and manipulate equipment. Using the virtual reality headset and stereo video, an operator can walk up to the control console, pick up the controllers, engage the manipulators, grasp a tool with one or both robot arms, and easily move them in unison to perform tasks. The team’s anticipated benefits of the robotic system for deactivation and decommissioning operations include improved situational awareness, increased mission complexity, and reduced operator training time, workload, and task execution times.